The star of this group is Henry, the very first snake in our Muleshoe study. Turns out a radio transmitter is not necessary to keep tabs on him, he stops by to say hi pretty often. He spends most of his time around headquarters and his large size makes him difficult to miss. Henry recently discovered our new pond, constructed on Save the Frogs Day by a middle school science class, and hunted there for nearly a month. The first day Henry arrived, we couldn’t see his red painted rattle to confirm his identification, but his size and behavior strongly suggested Henry. Like many of our neighborhood rattlesnakes, Henry doesn’t seem particularly scared of us. Even when getting close like in the above photo, Henry doesn’t rattle, tongue-flick, or even shift his gaze toward me. I guess after many years of encountering humans that don’t disturb him, he no longer perceives us as a threat. This attitude is shared by most of our neighbors. FiveLong’s usual spot is right along our path around the main driveway puddle. Despite humans approaching her multiple times a day, cars driving by, and sometimes splashing her, she used this spot nearly everyday in June 2012 and May through June 2013. Sometimes she looks at us when we get close, but that is the most reaction we’ve ever gotten from her. If we encounter our neighbors moving, usually they’ll pause and sometimes give us a brief warning shake of their rattle before going about their business. I imagine that their years of experience at the sanctuary of Muleshoe has taught them that humans are not to be feared or even avoided. 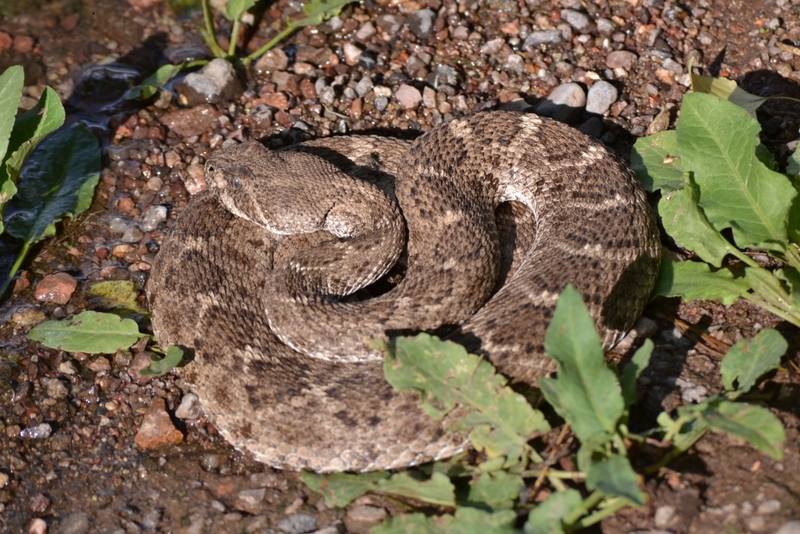 Rattlesnakes, and other animals here, have learned that this is a safe place. As Muleshoe’s former preserve manager put it, “where nature comes first.” There are few places left where nature doesn’t have to worry about getting in the way – of recreation, cars, yards, agriculture. But at Muleshoe, humans work around or with nature. 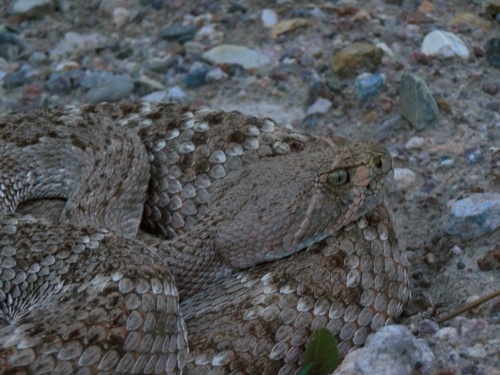 A guest gets to know one of Muleshoe’s friendly western diamond-backed rattlesnakes. 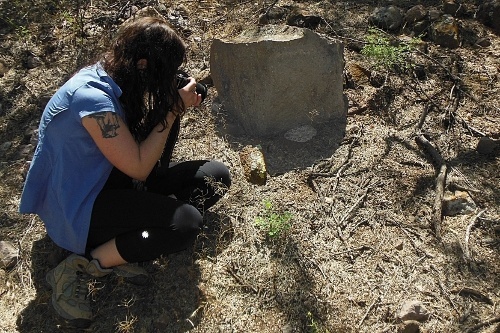 You can read more about the Muleshoe Nature Preserve here.